Since "The Oaks" first opened in 1905, families have passed through the metal gates, past the giant wooden solder, as the end of school marked the start of summer days announced the return of long days of fun at Oaks Amusement Park. Many of them arrived in anticipation of gliding among the clouds on a Ferris Wheel, holding their first-born while upon a carousel horse, or straining their vocal chords with their own screams as the roller coaster they're riding plunges down a four story track. Other updates to the historic park this year included a special concession area where visitors can relax in a Bumper Car from days gone by, or have a photo taken. Panels acknowledging the history of Oaks Park and its vintage amusement rides are also on display. Here is a look back at just a few of those amazing attractions. Portland was a bustling and busy town in 1905. City officials were preparing for the opening of The Lewis and Clark Exposition, a world exposition, and hotels and merchants were sprucing up city streets and storefronts for the expected arrival of thousands of tourists and sightseers. Traveling by boat, train, horse, and streetcar – or on foot – were the only widely available forms of transportation then; automobiles were still a novelty, and a toy of the rich. The Oregon Water Power and Railway was rushing to build an interurban track on the east side of the Willamette River that could take passengers on excursions as far east as Gresham and Estacada, or south toward Milwaukie and Oregon City, where a large part of the non-urban population lived. Fred Morris, President of the OWP&R, wanted riders on his interurban cars, and was building a major attraction to boost ridership on his new east-side interurban trolley line – an amusement park at the end of his line, near the community of Sellwood. And he planned to offer free admission into his park for those paying to ride there on the interurban, while those choosing to attend the Expo in Northwest Portland would have to pay an entrance fee. The new amusement park was being built on 44 acres of land just west of what many today know as Oaks Bottom Wildlife Refuge. Many of the rides in the park, and its wooden boardwalk, were built on twelve-foot pilings, since this section of land was close to the river's edge. Some of the larger attractions were so close to the water, in fact, that during a rainy week passengers aboard the "Blue Streak" roller coaster sometimes received an additional splash of water into their car. There would be serious consequences to this choice of location many years later during times when the Willamette River rose above flood stage. Wikipedia chronicles, "In 1948, the flooding that destroyed Vanport submerged Oaks Park for thirty days, killing a third of the bluff's oak trees, warping most of the rides, and resulting in damage to the rink that took five months to repair. . . The damage prompted the owners to rebuild the rink floor on airtight iron barrels, which would float in the event of another flood. The floats worked as planned during the area's Christmas flood of 1964 and the Willamette Valley Flood of 1996." But, back in 1905, Morris's gamble paid off. With over a million visitors crowding the City of Roses during the four-and-a-half months the Exposition was open, nearly 300,000 people paid to travel the interurban to Oaks Park. Once there, they paid to play the carnival games, to roller skate, to swim at the natatorium – and to relax in the shade of the oak trees with a picnic lunch, while bands played popular tunes in the background. But, the new park's premiere attractions were its amusement rides. Early rides included the Chute the Chutes, the Merry Maze, the Scenic Railway, the Rodeo, the Joy Wheel, and a roller coaster. When the Lewis and Clark Expo closed and the buildings were torn down, an amusement ride called the Giant Whip (which had been part of the Expo) was saved and ferried across the river, where it became a popular ride in the summer months at The Oaks. The Whirl was another ride that made that journey as well. The first amusement attractions were usually run by steam power, until electricity became available; and few men were experienced enough in the field to build one. Construction of a large two-story wooden structure like the Chute the Chutes demanded men with knowledge and skill. Other rides, like the roller coaster, required an engineer who could lay out complex twists and turns with steel tracks, while still keeping the riders from falling out of their seats! 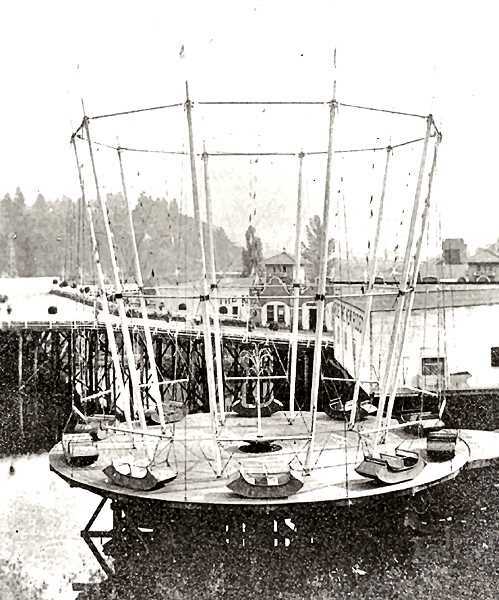 Jim Futrell, historian for the National Amusement Park Association, elaborated by e-mail that many of the first amusement rides were erected largely through trial and error. Few if any of the rides had any safety mechanisms installed to prevent passengers from flying off the tracks. The trial and error period was evident during the construction of the Loop the Loop ride (one of the first looping roller coasters) at Luna Park at Coney Island, in 1903. As pointed out on the "Heart of Luna Park" website, up to four ticket holders could be seated in a passenger car with rubber tires on the coaster. As the car raced across the course and made its loop, the only safety device that held the car on the track was a small side rail. Additional text on the story states that the owners of the Loop the Loop, "Made more money charging spectators to watch the frightened riders, than from selling the rides themselves." Few companies were experienced in the manufacturing of amusement rides, and orders were usually placed from companies on the East Coast or from Europe. At Oaks Park, Fred Morris rented out space to concessioners. They were responsible for building the rides and collecting the admission fees for them. Amusement owners were expected to earn a considerable amount of money on the popularity of their attractions – or they would be replaced the following season with more entertaining ones! Ira Shellenberger and Edward Bollinger were among the first vendors at Oaks Park. 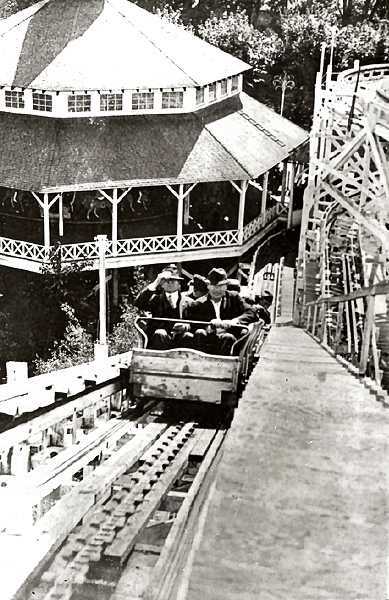 Bollinger, who later became superintendent of the park, was so smitten by amusement parks that he eventually stepped up and bought Oaks Park in 1925. The Bollinger family lived at the park, and when Edward died in 1949 his son Robert bought ownership of Oaks Park from Edward's widow. Over three decades ago, the owner of the park set up a permanent nonprofit foundation to operate Oaks Park in perpetuity, in hopes that the valuable land it was on would now never lead to its demolition for development. Many of the first rides at the park built by the industrious Ira Shellenberger included the Scenic Railway, Mystic River, and the Fun House. The first version of the Scenic Railway, which opened at Coney Island in 1884, was created by LaMarcus Adna Thompson, and was initially called the "Switchback Railway". Thompson had a patent on his ride, but during this period, other engineers could improve on an existing patent and not have to pay a fee. Creative engineers could recreate a slightly different model of the same ride, and lease it to another amusement park. Apparently they could use the same name the original inventor used. This is probably why Shellenberger was credited in the newspaper with building the Scenic Railway at Oaks Park. The Scenic Railway was a roller coaster that ran at a leisurely pace, with few dips and turns. Glamorous scenes of the Swiss Alps, or the Rhine River were painted on panels that were placed at various points along the track. Riders felt, or were supposed to feel, as if they were on their own personal journey to a foreign land. Local artists were probably hired to paint the exquisite scenery in vividly bright colors, to be seen as the railway cars ran through a tunnel equipped with electric lights (which was a luxury few could afford in 1910). Ira eventually sold his holdings in his amusement rides, and purchased a cigar stand at the Oaks, where he spent his retirement days selling gum, post cards, tobacco products -- and handing out for free many political views to patrons who passed by his booth. Attractions varied year by year, and some amusement rides seemed to become bland and outdated. Those were replaced with newer rides that were faster, steeper, and scarier, or which offered more thrills, and even raised the hair on the back of your neck. 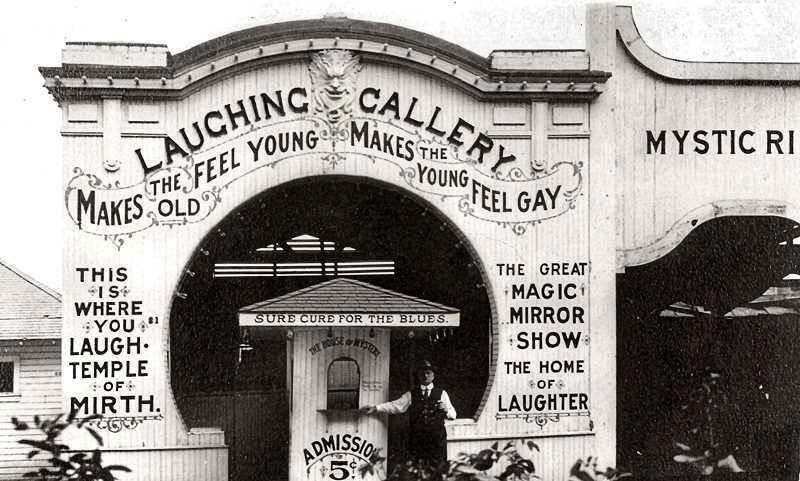 Oaks Park had a variety of different "Fun Houses" – the Laughing Gallery, Hilarity Hall, The Haunted House, and the Barrel of Fun kept young folks busy with unusual antics. Corridors and hallways were dark and filled with mysterious challenges. Young people had to maneuver around floorboards that moved back and forth, or spinning discs on the floor that sent young boys flying through the air. It was the type of hijinx that boys and girls of the time looked forward to on each visit. Other venues, like the Laughing Gallery, offered ticket-holders a maze of mirrors that disoriented them. Couples, locked hand in hand, bumped into one another, while others felt frantically along the row of mirrors until they stumbled on a way out – still in good spirits, but dazed with confusion. A revolving barrel-shaped door way was a typical attraction in the fun house. The rotating doorway spun faster as one attempted to step across, and the safest exit was on hands and knees. Some determined young men would attempt to climb the sides or hop from side to side but most of their attempts were useless, and they came crashing down to the floor in uncontrollable laughter. Frederick Bracher described his childhood adventures at Oaks Park in his memoirs "How It Was Then: The Pacific Northwest in the Twenties." The Barrel of Fun concession was filled with dark corridors in which gleaming skeletons leaped out, and strange groans and muffled shrieks could be heard from vague directions above. Pathways led to a lighted room full of distorting mirrors that made young boys look tall and gangly or short and as rotund as a beach ball. Girls still wore skirts and dresses back then, and a room with an air grating on the floor caught many by surprise. Children exited the concession by way of a two story slide, which sped them back down into the sunlit park. Older park patrons were drawn to the Ferris Wheel, which offered elevated views of the Willamette River and of downtown Portland to the north of the park. Young adults and teenagers preferred the challenge of climbing the numerous stairs on the "Chute the Chutes" ride. Their reward for the trek was a ride on a backless wooden seat, aboard a craft that rushed down the ramp and skidded across a small lagoon. Not many people yet owned cars in the 1920's, when the new Dodge'm Cars arrived at Oaks Park. For only a nickel, wanna-be motorists could practice their driving skills in these small oval-shaped cushioned cars. A solid rubber bumper surrounded the vehicle to protect against collisions, and drivers were quick to learn the value of a steering wheel that rotated 360 degrees. Cars turned in crazy directions, and often some youngster or timid kid would turn their vehicle in the flow of the traffic, causing the operator of the concession to run out onto the arena floor and get the lost soul headed back in the right direction. In what we now better know as "bumper cars", the plan of attack was to dodge and out-maneuver other cars, and avoid the drivers attempting to ram your car. Most of the fun was in the expected and unexpected jarring impacts. The dodge'm cars were run by electricity, and a mounted pole on the back of each vehicle ran to the ceiling to complete the circuit. An operator nearby turned the power on or off to get the contestants and their cars started or stopped. Occasionally, spectators waiting for their turn to drive got to witness the flickering sparks on the ceiling when the cars got into a pileup. Miniature trains were first introduced at the Oaks in 1910, and are still as popular now as they were over 100 years ago. Electrical rides like the "Mad Mouse" and the "Spider" eventually replaced those first amusement rides when the park first opened. By 1999, almost all rides were operated by sophisticated computers. But have amusement attractions really changed over the decades? Historian Jim Futrell suggests, "There are really no new ideas in the industry – just taking an old idea and making it better. Roller coasters and Merry Go Rounds have timeless appeal, and remain popular." When winter arrives each year, and Oaks Park closes for the season, people are still able to enjoy indoor activities. The Oaks is active with Roller Skating, Dancing in the Pavilion, and partying at the annual Oktoberfest, as well as various private parties and public events. But in winter, favorite amusement rides are shut down, asleep like hibernating grizzly bears. As cold winds blow and rain lashes the park, young children and bored teens still eagerly await the sunny days' return, when new rides and old favorites come back to life at historic, everlasting, Oaks Amusement Park in Sellwood.